The sixth episode aired in early December and was actually a story I had come across before. This episode covers the Hess story from beginning to end. While I knew a fair bit about the story, I was surprised to learn that Hess had been born in Alexandria, Egypt in 1894, the son of expat Germans. Robin W.G. Stephens, the commandant of Camp 020, and one of MI5's most feared interrogators was born in Alexandria in 1900. While separated in age by six years, one could wonder if the two families knew each other. The story then covers Hess's early life and is involvement with the Nazi party before delving into Hess's ill-fated flight to Scotland. Why exactly did he fly to Scotland? Was it really with a peace proposal for the Duke of Hamilton? Did MI6 know about Hess's planned arrival? All these, and other questions, are examined in some detail. After his capture, Hess's mental health seems to have taken a nose-dive and he made two suicide attempts while held in British custody during the war. After the Nuremberg War Crimes trials, Hess and six other Nazi inmates were sent to Spandau Prison. In 1966, the last of Hess's fellow prisoners was released and Hess became the sole inmate at Spandau, guarded in rotation by the four Allied powers - United States, Great Britain, France and the Soviet Union. Given that two of the other Spandau prisoners had also been awarded life sentences, why had they been released early but not Hess? The episode examines some of the theories around why Hess was never released. Was it because the Soviet's opposed losing a toehold in West Berlin? Was it to prevent Hess from becoming an icon for the Neo-Nazi movement? The episode then spends a fair bit of time focusing on the death of Hess by strangulation - did this frail 93-year old man manage to hang himself? Or was it murder... and if so, by whom? I thought that the episode could have delved a bit more deeply into the actual circumstances surrounding Hess's death. Which Allied power was on duty at Spandau at the time of Hess's death? Was there something that Hess knew that could have come out had he been released? Admittedly, the episode was only 45 minutes long, so it would be difficult to cover the entire spectrum of the story. The episode also makes no mention of how Hess's grave in Bavaria became a Neo-Nazi pilgrimage site, to the point that his remains had to be exhumed, cremated and scattered over an unnamed lake. 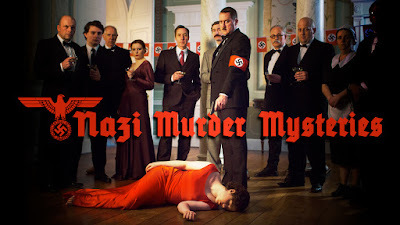 On the whole, thought this episode gave a good introduction to the Rudolf Hess story although there are many questions/issues upon which it failed to touch.